CARLA WOOLVIN and Marty Wake were agonisingly edged out at the semi-final stage as they produced the best show of the Portsmouth contingent in the national finals. Competing in the mixed pairs they beat rivals from Middlesex and Somerset but then lost by two shots at Royal Leamington Spa. 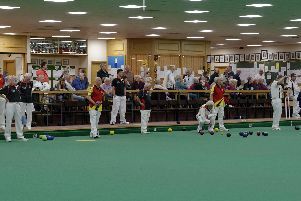 In total 23 bowlers from the Portsmouth & District League were competing in the national finals. Rowner’s Graeme Coles lost 21-12 in the last 16 of the men’s four wood singles, having beaten opponents from Leicestershire and Surrey. And Waverley’s John Biggs and Louis McCubbin were beaten 26-16 in the last 16 of the men’s pairs, having won first and second round matches both by the same score of 21-20. Waverley’s Mike Aldrin lost 14-11 in the second round of the men’s two wood singles. In the new junior (under 25) pairs, Alexandra’s Harry Hutchings and Danny Smith started off with victory over a talented pairing from Devon. They were then unfortunate to lose their last-16 match by one shot. In the junior singles, Waverley’s McCubbin lost 21-20 in the first round. Fareham’s Charlie Bailey lost in the first round of the four wood singles. In the pairs, Alexandra’s Steve Fielder and Paul Lawrence were beaten 18-17 in their first round match. Meanwhile, in the triples, Priory’s Peter Alcock, Roly Bloy and Adrian Snook lost in the preliminary round. Emsworth’s Merv Netley, Colin Clark and Allan Leppard lost their only game in the first round. Charlie Bailey lost in the first round of the champion of champions. Pam Lambshead, of Cowplain, was beaten 21-19 in the singles of the women’s championships. In the pairs, Lambshead combined with Cowplain’s Jane Franklin but they lost in the preliminary round. The Milton Park rink of Carla Woolvin, Pat Macrae, Julie Greenwood and Mandy Orchard lost in the first round of the fours. So far the Portsmouth & District League have five county champions. Charlie Bailey won the men’s four wood singles as he beat Rowner’s Graeme Coles 21-15 in the final. Alexandra’s Steve Feilder and Paul Lawrence beat Waverley’s John Biggs and Louis McCubbin 21-18 to win the men’s pairs. Waverley’s Mike Aldrin added to the Portsmouth success story when he took the men’s two wood singles crown with a 21-8 win. There was also glory for the Milton Park quartet of Carla Woolvin, Pat Macrae, Julie Greenwood and Mandy Orchard as they won the women’s fours 24-15. Earlier on in the year, the Alexandra duo Harry Hutchings and Danny Smith won the men’s junior pairs. Waverley’s Louis McCubbin lost out 21-20 in the final of the men’s junior singles.